Running Time: 2 hr. 8 min. For quite some time, I’ve had an idea for a movie. The basic premise involves an everyman who wins the lottery, seemingly guaranteeing him lifelong security and happiness. However, this seminal event soon alienates him from suddenly envious, greedy friends and family. Moreover, his newfound celebrity status becomes an albatross once the 24-hour media that builds him up uncovers and airs his personal foibles (an old arrest here, an extramarital affair there) in their insatiable hunt for tomorrow’s headline or talking point. It’s perilous to evaluate a movie based on what you hoped it might be. Still, Flight had the potential to dissect that tragic arc of the accidental celebrity. 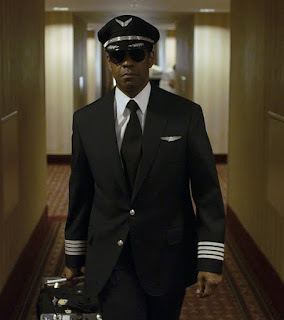 Captain William “Whip” Whitaker (Denzel Washington) is an airline pilot who executes a miraculous crash landing of his suddenly freefalling plane en route from Orlando to Atlanta, saving all but a few of its 102 passengers. Although rightly hailed as a hero, Whip is also secretly an alcoholic and drug user whose demons destroyed his marriage and estranged him from his teenage son. The key additional plot point is that Whip was also drunk and coked up during his aerial miracle, needing to ingest both substances together in order to achieve inflight acuity—to “level him off,” so to speak. So instead of a critique on contemporary culture, director Robert Zemeckis makes Flight a character study more akin to The Lost Weekend or Leaving Las Vegas. Alternating episodes of binge boozing and short-lived sobriety become the film’s repetitive refrain, often in concert with Whip’s newfound (and rather improbable) relationship with Nicole (Kelly Reilly), a recovering heroin junkie hoping to steer the captain towards sobriety. Directing his first live-action film since 2000’s Cast Away, Zemeckis still knows how to assemble impressive set pieces. A taut takeoff through storm-cloud turbulence is only a table setter for the amazing crash sequence, whose one of the most breathless scenes in recent cinema. Still, every protracted exchange between Whip and Nicole stops the film dead in its tracks when it should be focusing on the procedural particulars of the ever-tightening investigation into the plane crash and the efforts by a pilot’s union rep (Bruce Greenwood) and lawyer (Don Cheadle) to save Whip’s self-destructive backside. No time is devoted to the undoubtedly conflicted feelings of the passengers whose lives Whip saved or the families of those who didn’t survive. And while the emotional pain is palpable when Whip strong-arms the loyalty of Margaret (Tamara Tunie), his flight attendant and an old friend well aware of Whip’s addictions, a visit to his crippled copilot is used as an occasion for religious mockery. The sight of Whip’s foundering airplane clipping the steeple off a rural church serves a similar subversion, along with the sardonic testimonial by a terminal cancer patient (James Badge Dale) who Whip and Nicole meet while sneaking ciggies in the hospital stairwell. Ever the Steven Spielberg protégé, Zemeckis can’t resist his mentor’s penchant for soppy endings and heavy-handed metaphors, or his own crutch of classic-rock music cues. Buttressed by another career-defining performance from Washington, the ill-fated aircraft parallels the path of its protagonist: a life in free fall that must be inverted to level off its descent before a crash landing that starts him down a course of introspection and redemption. Still, Flight could have cast a wider cultural net about the media, hero (de)construction and survivor guilt, not just the story of one self-absorbed antihero.